We are pleased to be able to announce the 11th annual El Haddawi Winter School. 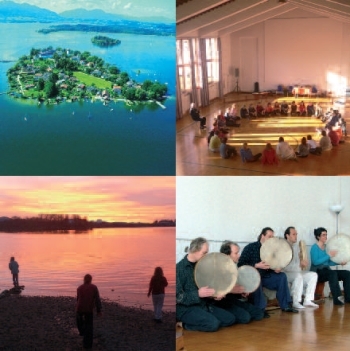 It will take place from March 7th to March 13th 2010 at the island convent "Abtei Frauenwörth" on the Chiemsee lake in Bavaria, Germany. Joe Martin, who has previously been a visiting teacher at the Winterschool, has written a very impressive book: The Rose and the Lotus: Sufism and Buddhism. It was this book which provided us with the inspiration for the theme of our next Winter School. We live in an era in which distances on the globe become smaller, and thus different spiritual traditions get to know one another more closely. This has provided the opportunity for a spiritual renaissance. Different mystic paths or wisdom traditions may now become more closely acquainted with each other, learn from one another, and exist equally side by side. We will explore the connection between wisdom paths of Sufism and Buddhism. In this process we will investigate the relation of mysticism to daily life, while we stage and perform work that arises from our exploration. Does the mystic experience of daily life take place in a separate realm or space from the experience of performance? Or do they permeate one another other? If our world is a spectacle, a theophany - if all our world is a stage - what is it that takes place on the conventional stage? Zen-Master, Benedictine priest, author, founder of the spiritual retreat centre Beneditkushof, will give the opening lecture. Theatre director, author, senior lecturer for the Theatre Arts and Studies Program at Johns Hopkins University; a teacher of contemplative practice employing Sufism and Buddhism. Psychotherapist, working internationally in academic research and teaching, author, since 30 years on the Sufi-path, 1996 pilgrimage to Mecca. Nishin Toda is abbot of the Buddhist Onjuin temple near Tokyo. As head-priest (Denshi) Nisshin Toda is empowered to educate teachers of Aragyo (a way of religious austerities). He is the only authentic lineage holder of this tradition. studies in psychology and philosophy at Istanbul University. 1976 founding of the music group Tümata. As musician, psychologist and Sufi-master he focuses on the connection between modern medicine and ancient Central Asian music- and movement-therapy. certified ergotherapist focusing on body-oriented therapy methods. Also practicing ancient Central Asian music- and movement-therapy and methods of Islamic Sufism. Exercises drawn from different spiritual traditions and bodywork systems will allow us to approach mystic experience and understanding. Acting, dance, movement improvisation and meditation as well as elements from the martial arts, will open new levels of practical experience for body, spirit and soul, and give access to unknown inner spaces. In addition to seminars taught by Ingo Taleb Rashid the Winterschool consists of classes and lecture-demonstrations taught by the invited lecturers. There will also be an opening ceremony, performances and an integral music and dance concert. Accommodation and meals will be provided on site. (starting with the opening at 17/03 at 18.00, ending at 13/03 lunch) including all classes, lectures and special events. Fees for accommodation, meals and transportation are separate. Meals will cost approximately € 30 per day (3 meals including various teas, Indian vegetarian and non vegetarian food). Accommodation will cost between € 22 and € 52 per night, depending category of rooms. We cannot guarantee the chosen room category. Early registration (until 1st of February 11th, 2010) and payment of the non-refundable deposit of € 200 will reduce tuition to € 380. Partial attendance: It is possible to participate in the Winter School's first half (07/03 opening/18.00 -10/03 lunch) or second half (10/03 supper - 13/03 lunch): Tuition for half of the event is € 260, or € 230 with early registration. The Winter School can be taken in place of a start-up seminar for the Movement Concept® educational program 2011.